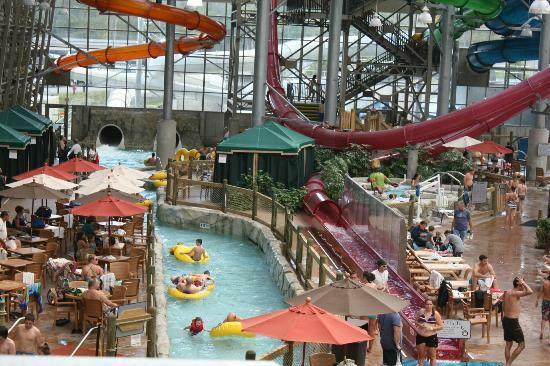 Indoor Waterparks in New England are where it's at. If you’re willing to pay cold hard cash to be transported to a balmy 84 degrees (albeit indoors) during a New England winter, this article may be for you. Your desire to be warm, however, must trump any issues you may have with things like extremely high levels of chlorine, tons of wet people everywhere and the possibility of recreational waterborne illnesses. For me, I’d risk contracting e.coli for tropical humidity in January any day. Solution? Indoor water parks. They’re close, they’re fun and they’re warm. Deliciously and beautifully warm. Note: Almost all of the indoor water parks discussed below offer discounts and special package deals on sites like Groupon, TripAdvisor, etc. or on their own websites. Be sure to Google special deals before booking and you could score some sweet savings. 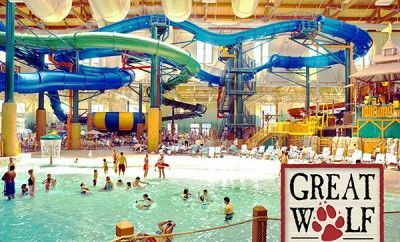 Less than an hour and a half from Portsmouth, Great Wolf Lodge is 68K square feet of aquatic fun including water slides (for singles and groups), lazy river, children’s splash pool, water fort tree house, wave pool and more. There are also a ton of non-water related activities including an indoor ropes course, bowling alley, mini-golf, lazer tag, MagiQuest (an interactive scavenger hunt which is an extra expense but I highly recommend splurging on it) and so much more. You will *not* get bored here, ever. GWL does not sell day passes; you must be a registered guest of the hotel to visit the water park and extended facilities. Prices start at about $199 per night for four people. Visit greatwolf.com for more info. I have personally been here and really liked it. It was warm, clean and offered tons of activities. I would not recommend the onsite restaurants for dinner (either order in or go out), but other than that, it got a thumbs up from me. Only 45 minutes from Portsmouth, CoCo Key is a great day-trip option. Although they have an onsite hotel, you are not required to stay overnight to access the water park. The park has an adventure river, water-filled jungle gym, zero-depth entry pool and play area, indoor/outdoor spa, several water slides and an activity pool (think water basketball, obstacle course). I like this place because they put in a lot of cheesy tropical décor, but it makes me forget there’s snow outside so I’ll take it. Do bring your own towels (not offered); don’t bring your own food or drink (not allowed and the onsite options really stink but you’re pretty much stuck with it). Full-day Passes $45; Under 48” $35; Spectator Pass $20. Special pricing after 4pm available. Tickets must be booked in advance. For more info, visit cocokeyboston.com. As part of the Red Jacket Mountain View & Resort, this water park has four water slides (single and double riders), a wave pool, water basketball court, 25-person hot tub, toddler pool area and a play tower area with water cannons, rope bridge, slides and a 175-gallon tipping bucket. At 40K square feet, this park is almost half the size of the ones mentioned above but still fun for a day or two. You must be an overnight guest of the hotel to access the water park (and even then, there is an additional cost of $40 for kids/adults ($50 on holidays or during school vacation) or a $10 observation pass. For reference, this location is less than two hours from Portsmouth. Visit kahunalaguna.com for more info. As part of the Jay Peak Resort, this park offers several slides, lazy river, kids play area, indoor/outdoor hot tub, double-barrel “flowrider” (a cross between skateboarding, surfing and snowboarding on water). At 3.5 hours from Portsmouth, this one’s definitely a road trip but I’ve even seen some combo ski/splash specials for Jay Peak Resort that would be worth it if you wanted to ski, as well. However, day passes are available if you choose to stay elsewhere. For more information, visit jaypeakresort.com. Newly renovated, this 30K square foot water park includes 4 water slides, lazy river, kiddie area, wave pool and a 24-person jacuzzi. Day passes are available ($40 adult, $30 under 48”, $20 spectator pass). Water park admission is included in any overnight stays booked directly with the hotel itself (no third-party vendors). Hyannis is a 2.5 hour drive from Portsmouth so you “could” make it a day trip but I think they are some better, closer options. For more info, visit capecodderresort.com. If you need to find me, I’ll be the one in the lounge chair with my eyes closed pretending it’s summer. I don’t even care if it’s manufactured. Previous PostChow time! “Cowboy Night” makes for super fun family dinners. Next PostGet outdoors! Places to go for fun family nature stuff on the Seacoast.